With innovative teaching styles, flexible boarding options, and signature academic programs, the entire concept of boarding school has evolved a lot over the years. By and large, these institutions are no longer the traditional schools that your parents or grandparents may have attended. Boarding school offers a well-rounded academic experience that is both challenging and rewarding, and is a place where intellectual, social and emotional maturation flourishes amidst a supportive community. Do you think your child would benefit from a college-campus-like learning environment, but you do not want him or her away from home all week long? Most boarding schools also accept day students and some even offer flexible boarding programs. For example, starting in the fall of 2019, The Masters School in Dobbs Ferry will offer a five-day boarding option, in addition to their full-time boarding program. If that's got your wheels turning, here are five other reasons why you and your child should consider boarding school. In public schools, the statewide curriculum doesn't leave much room for improvisation. But as private institutions, boarding schools get to explore different teaching philosophies and methods to find what works best for students, such as the Harkness method employed at The Masters School. This discussion-based teaching style takes place around oval tables that encourage interaction, critical thinking and exchange of ideas. Regardless of college track or professional field, these talents and skills are critical to future achievement and success. At boarding school, relationships with teachers aren't something to be checked at the door on the way out of class. Since so many faculty members live on campus, many of them are also dorm parents, coaches, club sponsors, advisors and even just a friendly face in the dining hall. Faculty members get to see students engage with and grow across a range of environments, and are well-positioned to offer support. It is one thing to learn how to get along with siblings; it is another thing entirely to live cooperatively with new people from all walks of life. Experience in navigating shared living spaces is a growth opportunity that prepares young people for college and later life. 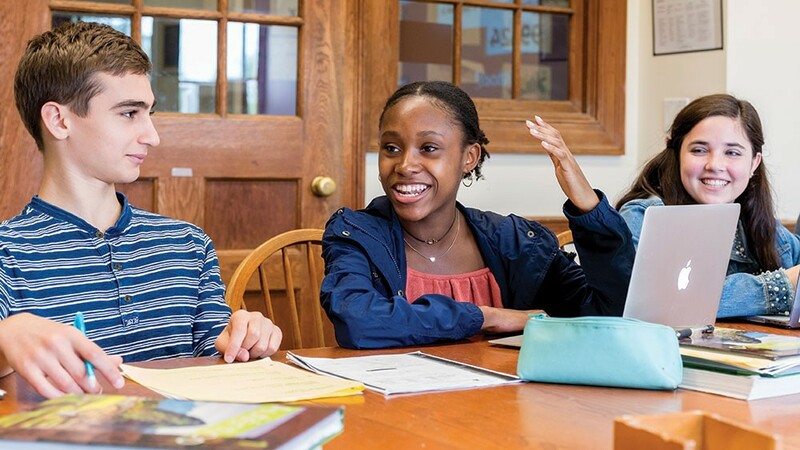 Whereas most schools are a reflection of an area's demographics, boarding schools draw students from around the country and the world, creating a culturally and racially diverse environment for learning and living. The Masters School in Westchester has students from 13 states and 30 countries. A Hudson Valley student could have a roommate from California and be in math class with a student from South Korea. With excellent facilities and resources, boarding school can be a hotbed of innovation, fostering creativity and propelling some of the brightest young minds to their first great accomplishments. Special programs, like The Masters School's Innovation, Engineering & Entrepreneurship curriculum, elevate STEM to a new level by offering students the opportunity to earn college credits and preparing them for future opportunities in the real world. With dynamic classes, a wide array of athletic, performing and visual arts offerings, engaging co-curriculars, community mealtimes, and dorm life, the opportunity to learn and have fun with friends never stops. By creating their own schedules and balancing their commitments, students learn self-discipline and independence, all while experiencing a well-rounded education and cultivating lifelong relationships. So if you are considering boarding school to help prepare your child for college, career and life, do your homework, visit campuses, and talk to students. You will be glad you did! The Masters School Open House October 20: grades 5-8 at 9am, grades 9-12 at 1:30pm. To RSVP, contact admission@mastersny.org or (914) 479-6420.